Come play croquet with us! As a fully established club, we have become an integral part of Sandwich Hollows and the Sandwich community with a full sized croquet court, a Board of Directors, and a consistent membership of two dozen or more. Fun and comradery have been the name of the game at Sandwich Croquet with our many tournaments, exciting social events, special lessons, and the many, many days of fun and challenging croquet. 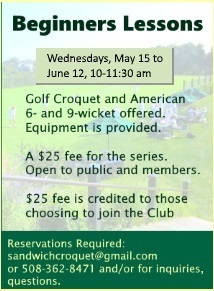 The Sandwich Croquet Club (SCC) is a growing club located on Cape Cod at the Sandwich Hollows Golf Club off the Service Road in East Sandwich, Massachusetts. Six-wicket American, Nine-wicket, and Golf croquet are played regularly on four well-maintained courts. Equipment is available for use during scheduled play times. Membership is very affordable. Handbook Our rules and guidelines for play. Click here. The club is an active member of the United States Croquet Association (USCA). Our SCC season is May through November, with play on Tuesdays, 2:00-4 pm, Thursdays 5-7 pm, Saturdays, 10:00-12:00, and Sundays 3:30-5 pm. The courts are also open to members for play (pick up games, practice, etc.) during daylight hours when they are not used for scheduled group play, tournaments or maintenance. Courts will be open Monday, Wednesday, and Thursday AM; Monday, Wednesday, Friday, and Saturday PM. Following play, we often dine at the Clubhouse Grill or other local restaurants. On Saturdays, play can continue into the afternoon if desired. Lessons are available on Thursdays at 3:30 pm, or are scheduled several times during the season. Experienced players are always available to help new players, especially during the half hour before scheduled play. Regular play days will be on Tuesday (2-4), Thursday(5-7), Saturday (10-12). and Sunday (3:30-5) Lessons will be on Thursday at 3:30. Tournaments and additional social events will be scheduled as fun for all.